SACRAMENTO, Calif. (CN) – Federal and California law enforcement officials announced Tuesday they are coming after Mexican drug cartels not just for their lucrative illegal marijuana, but for their outlawed pesticides as well. 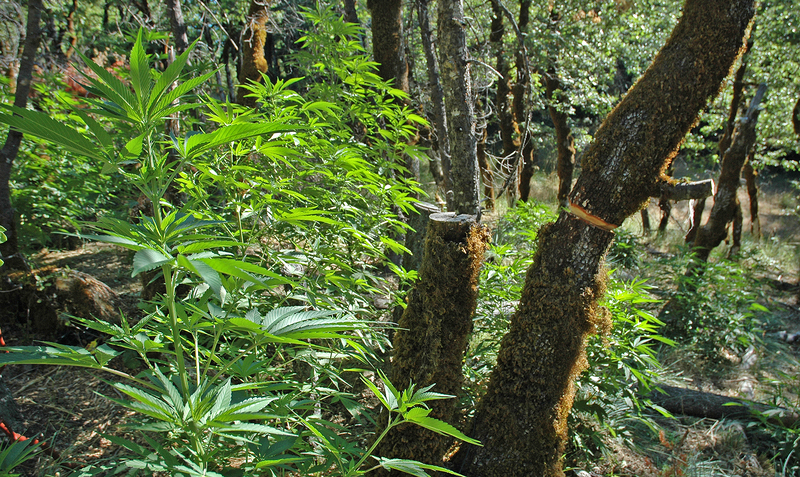 Hoping to stem the expanding use of a banned pesticide in outdoor grows that scientists warn has California facing ecological disaster, authorities said they will spend millions to kill illegal pot farms on public land. Large-scale marijuana operations have flourished in California for decades, well before voters approved medical and recreational cannabis. Pot is easily grown outdoors in some of California’s most picturesque settings, from its redwood forests south to the Yosemite Valley. But researchers are sounding the alarm after discovering illegal growers are ramping up use of a toxic pesticide banned in the U.S. to keep rodents and pests off plants during the growing season. The chemical, carbofuran, is leaching into nearby streams, potentially killing protected salmon and other wildlife. Carbofuran has one of the highest acute toxicities to humans of any insecticide, and the U.S. Environmental Protection Agency canceled all food tolerances for the pesticide in 2009. A quarter teaspoon may be fatal. The pesticide is absorbed by plants through the roots and distributed to a plant’s vessels, stems and leaves concentrating it. Scott said the pesticide is being funneled into California’s forests by Mexican drug cartels, noting that all of the recovered carbofuran bottles were labeled in Spanish. Mourad Gabriel, executive director of Integral Ecology Research Center, said use of the pesticide in California has exploded over the last decade. His group found traces of the pesticide at 78 percent of surveyed sites in 2017, up from 12 percent in 2012. Similar to the ecological damage of California’s Gold Rush which poisoned rivers and streams, Gabriel said the widespread use of pesticides on outdoor pot grows will have certain environmental aftershocks. “If we continue to do this without offsetting or removing these impacts or threats, there is a potential of a legacy downstream effect that is going to essentially impact everything within the food web, including us,” Gabriel said. The research center has been extensively studying marijuana grow site operations since 2012, even joining law enforcement on raids. Its expansive research has found traces of pesticides in carcasses of the protected Pacific fisher, deer, bears and owls near grow sites. With the growing season underway, federal funding to assist eradication efforts is coming to California. Scott said 90 percent of $2.5 million recently appropriated by Congress to fight illicit grows will go directly to the Golden State. He added that U.S. Attorney General Jeff Sessions is taking a “keen interest” and that federal prosecutors will explore adding environmental crimes to those charged with growing pot illegally in California. “We’re not satisfied with just the three or four people we find at the grow site; we want to get the people who are really making the money off this,” Scott said.